Quantification of vegetation cover from pollen analysis has been a goal of palynologists since the advent of the method in 1916 by the great Lennart von Post. 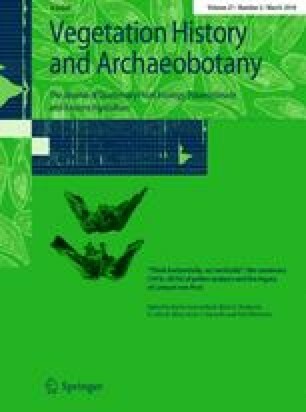 Pollen-based research projects are becoming increasingly ambitious in scale, and the emergence of spatially extensive open-access datasets, advanced methods and computer power has facilitated sub-continental analysis of Holocene pollen data. This paper presents results of one such study, focussing on the Mediterranean basin. Pollen data from 105 fossil sequences have been extracted from the European Pollen database, harmonised by both taxonomy and chronologies, and subjected to a hierarchical agglomerative clustering method to synthesise the dataset into 16 main groupings. A particular focus of analysis was to describe the common transitions from one group to another to understand pathways of Holocene vegetation change in the Mediterranean. Two pollen-based indices of human impact (OJC: Oleaceae, Juglans, Castanea; API: anthropogenic pollen indicators) have been used to infer the degree of human modification of vegetation within each pollen grouping. Pollen-inferred cluster groups that are interpreted as representing more natural vegetation states show a restricted number of pathways of change. A set of cluster groups were identified that closely resemble anthropogenically-disturbed vegetation, and might be considered anthromes (anthopogenic biomes). These clusters show a very wide set of potential pathways, implying that all potential vegetation communities identified through this analysis have been altered in response to land exploitation and transformation by human societies in combination with other factors, such as climatic change. Future work to explain these ecosystem pathways will require developing complementary datasets from the social sciences and humanities (archaeology and historical sources), along with synthesis of the climatic records from the region. This research is funded by the Leverhulme Trust. Earlier versions of this paper were presented at the von Post centennial symposium in Stockholm in November 2016 and the International Pollen Congress in Brazil in 2016, and constructive comments from Thomas Giesecke and John Birks were particularly valuable in shaping the analysis. This study is a contribution to the Past Global Changes (PAGES) project and its working group LandCover6k (http://pastglobalchanges.org/ini/wg/landcover6k/intro), which in turn received support from the US National Science Foundation and the Swiss Academy of Sciences. LandCover6k is coordinated by Marie-José Gaillard (Linnaeus University, Kalmar, Sweden). We thank all contributors to the European Pollen Database and the two reviewers whose comments resulted in a much improved paper.